French automotive giant Renault has unveiled the EZ-PRO, an autonomous delivery concept that could provide a modular, last-mile option for logistics operators. Renault launched the futuristic concept at the Hannover Motor Show this week, highlighting the company’s confidence in this potentially lucrative market. The ‘last mile problem’ is a critical challenge for cities, as the boom in online and mobile commerce has caused an influx of petrol- and diesel-powered vans into crowded centres and suburbs, ramping up pollution. 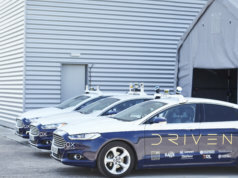 Companies are exploring a range of solutions, from autonomous electric vehicles to electric bikes and scooters, together with the longer-term promise of drones that can operate beyond visible line of sight (BVLOS). The EZ-PRO promises to tackle a number of the challenges faced by both logistics companies and city planners. 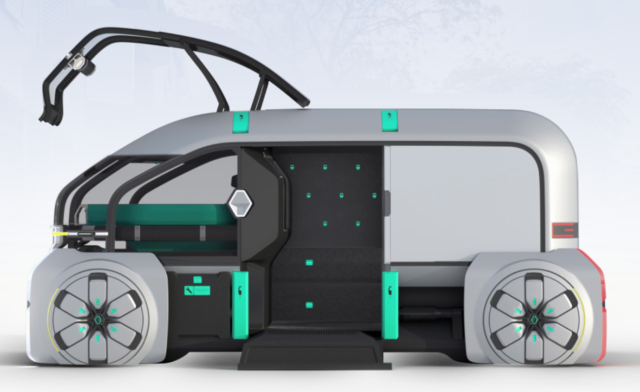 For starters, the manufacturer’s proposed ‘robo-pods’ could help delivery businesses manage pollution and urban congestion. They also include features designed to meet the expectations of demanding customers. An autonomous future with people at its heart? Renault’s EZ-PRO is an electric transport platform capable of tapping into smart city infrastructure to better organise deliveries. It consists of an autonomous leader pod and a train of driverless robo-pods. The robo-pods can be customised to suit their freight type. The leader pod has been designed to carry a human concierge, who would be on hand to supervise deliveries and focus on “value-added tasks, such as the itinerary planning and the driverless robo-pods, or ensuring efficient and customised service, such as in-person, premium delivery of groceries or fragile objects”, said Renault. 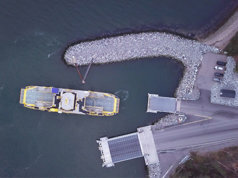 In the company’s vision, a convoy of EZ-PRO pods would depart from a single hub, managed by the same logistics operator, but ferrying goods for different clients. 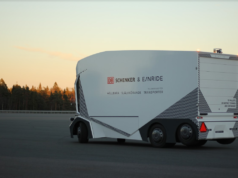 The same electric, autonomous platform could make a series of deliveries for multiple online stores concurrently to maximise productivity and cut costs. To keep customers happy, recipients would be able to select a convenient delivery time and location. 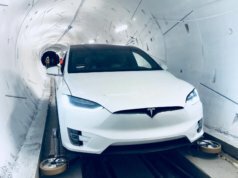 The end user could also choose between receiving their parcel from the concierge, or accessing self-service lockers in the driverless pods. Laurens van den Acker, senior VP of corporate design at the Renault Group, believes the EZ-PRO concept finds the middle ground between an efficient solution and customer-friendly technology. “With EZ-PRO, we continue our exploratory work around urban shared mobility of the future,” he said. “Focused on delivery solutions, this autonomous, connected, and electric concept represents the ideal tool, being both a creator of opportunity for professionals, and a facilitator of services for all its users, direct or indirect. Whether the system will end up as anything more than a shiny concept illustration remains to be seen. But as with all concept vehicles, it reveals the thinking behind the design and a possible direction of travel for both its maker and the industry. While the announcement is short on detail, it does emphasise that Renault is keen to move into logistics and be at the forefront of the driverless revolution. 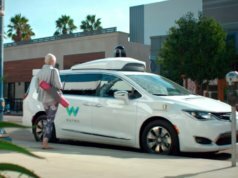 This comes as no surprise following the unveiling of the company’s plans for an electric, autonomous ride-sharing service back in March: the EZ-GO. Clearly this is a brand with potential. But is it really so ‘EZ’? As is sometimes the case with concept vehicles, Renault’s solution seems over-engineered and unnecessarily complex, particularly for crowded streets and difficult-to-access addresses. 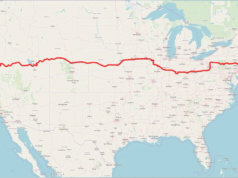 This demonstrates that the last-mile challenge is tough to meet, especially in old cities that were never designed for 21st Century lifestyles. Indeed, few were designed at all.